?Wasabi Ginger Sushi with lime sesame cauliflower rice and spiralina avocado mixed green salad. 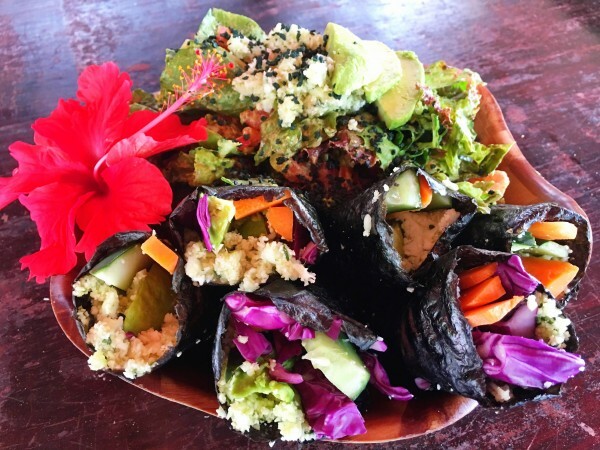 Rolling my own plant ?strong nori sushi is always such a blast! Amanda Sylvest, Ruby Moon and I played in the kitchen today whipping up a variety of sauces, rolls, sauerkraut, and hummus. This is one of our many creations over the last few weeks during their month long fellowship in my Epic Living Academy here in Costa Rica. It’s often intimidating to look at a counter full of raw veggies and wonder what to do with them. It’s much easier than you think! I promise. Believe me, I have been where you are. I rarely cooked before I transitioned into a raw vegan lifestyle. I ADORE teaching others how to make delicious and super healthy cuisine that they can share with their friends and family. It’s one of the most valuable life skills you could ever gift someone. Feeling awesome mind, body and spirit stems from everything you put in your mouth. We must start with our forks guys! Optional: You can put the ginger wasabi sauce in the nori rolls or leave it on the side to dip! 2. Massage the sauce until it’s spread out evenly -that’s right, get your hands in your food!